Who hasn't gone to a home show looking for the new and arresting, but come away more impressed with the tried and true — work by men and women like Andres Schneiter, and designers Brent Neave and Dwaina Sprague. They were exhibitors at the recent Interior Design Show West — or IDSwest — and caught the eye of reporter Claudia Kwan as she walked the floor of the waterfront convention centre. These are her interviews. Schneiter uses traditional methods of joinery and marquetry to bring out the natural beauty of the wood, eschewing nails unless they're absolutely necessary. He understands why people buy mass-produced furniture -maybe it's what they can afford at the time, or maybe they're looking to pick up something quickly — but says custom furniture is worth the price. 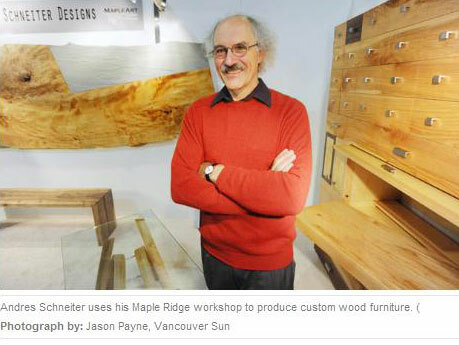 While word of mouth and his website — www.mapleart.ca — helps to bring in a lot of business, Schneiter says it's important to show individual prospective clients his work. He brought the pieces mentioned above to IDSwest to exemplify the difference between custom craftsmanship and everything else out there.